Happy Holidays everybody! It’s Andy Gesner and the staff from HIP Video Promo, checking in with another great clip from a remarkable singer-songwriter. For many years, Denise James has been one of the clearest voices ringing out from the Detroit underground: a super-stylized singer with an immediately recognizable sound and a record collection to rival Jack White’s. 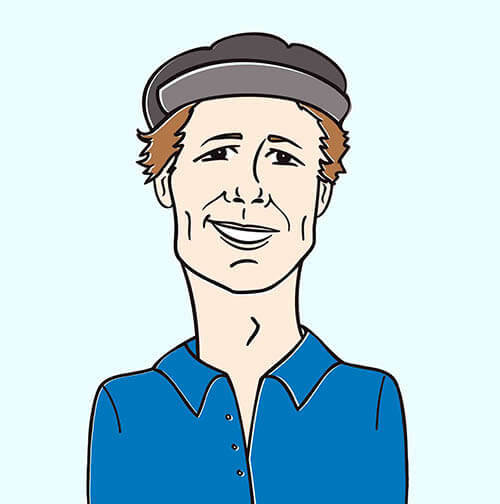 A favorite among Detroit rockers and Michigan cognoscenti, James sings in a soft, radiant alto reminiscent of the finest European pop stars of the mid-Sixties. We’re thrilled to be working with Rainbow Quartz – a label that knows a thing or two about psychedelic revival – to bring her music to a wider audience. Denise James is a Motor City loyalist (she’s been a member of the rock version of His Name Is Alive, as well as several other popular Detroit groups), but she’s French by ethnicity – and the long shadow of Francoise Hardy hangs over her songwriting. Like Hardy, she’s able to generate some legitimate trippiness with little more than a couple of guitars, a collection of clever melodies, and a haunting singing voice. Producer Matthew Smith bathes her songs in period-specific reverb, and members of Detroit club staples The Volebeats, Outrageous Cherry, and The Dirtbombs are on hand to make instrumental contributions. The clip for “Love Has Got Me Crying Again” plays with perception and visibility, pairing natural settings with studied film techniques. 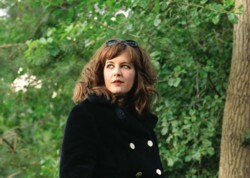 Director Nicolas Hill shoots James outdoors; dressed in vintage autumn jackets, she sings toward the camera from beneath a tree, and beside a lake. No wind ripples through the leaves, and the surface of the water is placid – likewise, James is impassive, cool, poised. She purrs her lyrics of heartbreak and bewilderment with a disturbingly straight face; her performance is disquieting, yet undeniably engrossing. If James herself is the picture of stasis, the camera is in constant motion. Images blur and bleed into white washes, pictures swing wildly in and out of focus. Just as the track is drenched with reverb, Hill floods his film with an unearthly white light. At times, the footage seems deliberately overexposed; at others, the colors of the outdoor scene look otherworldly, unnatural. In several shots, a window, glazed with water, hangs between the singer and the camera. Hill allows the beaded surface of the glass to refract the light, and to produce a naturally muted and distorted image. It’s soft, gentle, quietly dreamy, mildly psychedelic; a manageable but intense altered state. Any programmer who adds the Denise James “Love Has Got Me Crying Again” clip, or the companion Rainbow Quartz video “When She Comes Around” by Myracle Brah during December or January will be automatically entered into a drawing to win the entire Rainbow Quartz current catalog, which includes releases by The Lovethugs, The Jessica Fletchers and The High Dials. In addition, each programmer who enters will receive a Rainbow Quartz prize package including Rainbow Quartz posters and other cool stuff. The drawing will take place on January 22, 2005. If you need more info call Andy Gesner at 732-613-1779, or email HIPVideo@aol.com. You can also visit Rainbow Quartz Records to find out more about Denise James.